A couple weeks back, I was excited to hear that king salmon fishing was open in California, but when I inquired about buying local salmon at Staff of Life, my favorite natural foods store, they said it would be several weeks before commercial fishing is allowed. 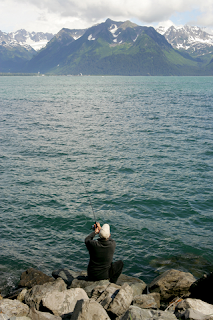 Right now the season is only for non-commercial anglers, and we will not be able to buy local salmon until May. With the help of Paul Johnson’s book “Fish Forever, ” let’s take a look at some bad alternatives first. Unfortunately, this includes most of the salmon available on the market today. Over half the salmon that is eaten in the world is Atlantic farm-raised salmon. It’s available in any season, uniformly sized, and agreeable if not exciting in taste and texture. Nearly all of this salmon is farmed by a few huge multinational aquaculture corporations that control all phases of the industry from penning to fishing to marketing to manufacturing fish feed (from wild fish that they catch.) Eating such salmon is far from my idea of eating locally in season. Before I describe how this large-scale farming is harmful to the environment, I’d like to point out that not all farmed salmon comes from multinational corporations. According to Johnson, there are small-scale artisan salmon farmers using best practices such as low pen population density, prevention of escape into wild populations, and more efficient feeding methods, both in terms of amount of wild fish used in feed and food escaping into the environment. Eating fish from these local mini-farms encourages best practices and local farming, so is a reasonable alternative to eating wild salmon. So why is large-scale salmon farming so costly to the environment? Salmon is farmed in open-ocean net pens packed as full as possible for maximum profit. This unnatural crowding necessitates use of antibiotics. Since movement is restricted, farmed salmon have lower blood circulation hence paler flesh than wild salmon. So farmers add colorants to the feed to make farmed salmon the color that consumers expect. The feed itself is wasteful, made from wild fish harvested by the corporation, and dispersed in larger-than-necessary quantities for maximum fish growth in minimum time. Keep in mind that each of these open ocean pens is located inside a natural environment with native populations. Excess feed goes right through the nets and into the environment to be snapped up by local fish. Contamination of local fish with manufactured foods, colorants, and/or antibiotics is inevitable. Breeding individuals themselves sometimes escape (wouldn’t you?) and interbreed with local populations, causing alteration of natural genetics in native populations. You might have wondered why Atlantic farmed salmon is so much cheaper in the store than local wild salmon, given the costs of farming and transportation. The answer is simple: this industry is highly subsidized by governments, which means that your tax dollars are paying for it. As Paul Johnson says, “corporate farmers have not taken full responsibility for the cost of raising these fish.” As a result, consumers have an unrealistic idea of the real dollar cost of farmed salmon, making the cost of wild salmon seem high in comparison. This competition in the marketplace has driven the price of wild salmon to its lowest in thirty years, and forced many small-scale fishermen out of business. Because farmed salmon is available at any time of year, consumers are fooled into thinking that salmon season should be year-round. A manmade environment makes this so. However, to preserve wild salmon’s natural environment and populations, consumers must tune into the salmon’s annual/seasonal cycle. Salmon can only be sustainably fished during certain months, and conscious consumers will choose that time to eat salmon. To learn more about the salmon fishing industry, past and present, and how we can be stewards of our watersheds in support of healthy local salmon populations and sustainable fishing methods, Paul Johnson recommends the book “Salmon Nation ” by Elizabeth Woody. I have not read it yet, but just added it to my “to read” shelf at Goodreads.com. In the meantime, I hope you will join me in boycotting farmed salmon. Let’s commit to eating local wild salmon when it is in season, and choosing environmentally friendly alternatives when it is not.